If so State Tech’s Physical Therapist Assistant program may be right for you! The Physical Therapist Assistant (PTA) program prepares students to play an important role in the therapy of patients. 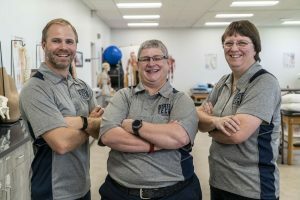 This program equips graduates with the technical and personal skills needed to help return patients to satisfying and independent lives and assist Physical Therapists with a wide-range of diagnoses for people of all ages. Our curriculum is updated annually to include the latest trends and technologies. The program also receives input from our industry partners and the Missouri Health Professions Consortium (MHPC). A Physical Therapist Assistant degree prepares students to pass the licensure exam. Passing the licensure exam opens broad career opportunities. To be considered for the Physical Therapist Assistant program, you must meet these application requirements.